A creamy hard-boiled egg spread. 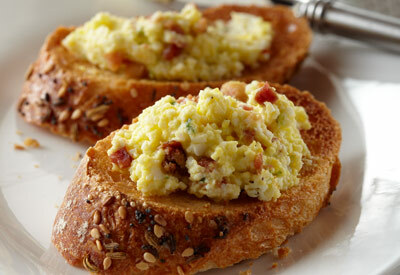 Pair with toasted baguette slices for a crowd-pleasing snack or appetizer. PLACE eggs, ranch dip, green onion, salt and pepper in food processor. Pulse until finely chopped. SPOON into serving bowl. TOP with bacon. SERVE with toasted bagels or baguette slices.